The one with Random Wednesday - OPI, Jesse's Girl and Ulta! But on to the polish! 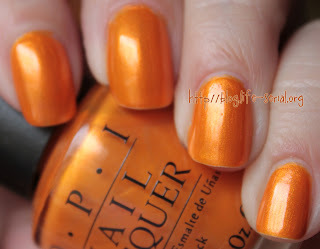 First up is an OPI black label called Tangerini Bikini. I got it from my friend Stacie who is a local nail tech. She laughs at me when I go gaga over some of the polish she has...and decided one day to sell me some :) The orange shimmer is so right up my alley! Since it's a black label, that means it's older...and therefore the formula is great! 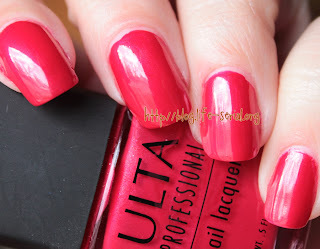 Next we have an older swatch of Ulta The Devil Wears Red. My nails were quite long whenever I took these photos! hahah This color is close to a pinkish hue to me, or maybe it's just that it's got some pink and/or orange in it. It's a creme, and is awesome in two coats. And finally....a Jesse's Girl polish that I'm not sure of the name! Girl's Night Out maybe? 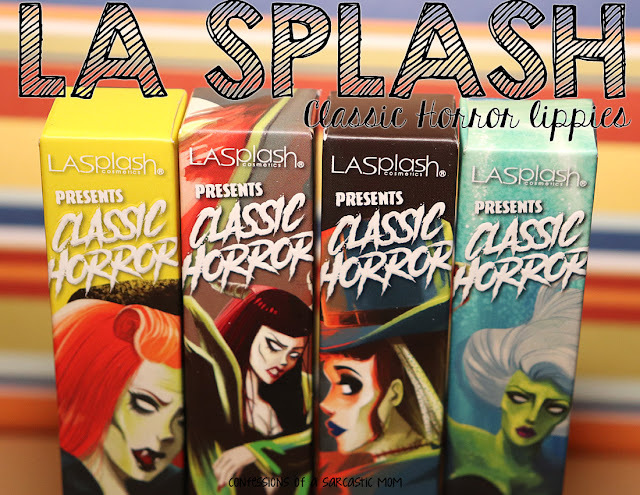 The formula was really thin on this one, and I noticed shrinkage the next day when I wore it. Could be a combination of the formula and the top coat. I love the color, tho. It's super pretty! Have you checked out the Beauty Blog Coalition $500 Visa Card Giveaway?